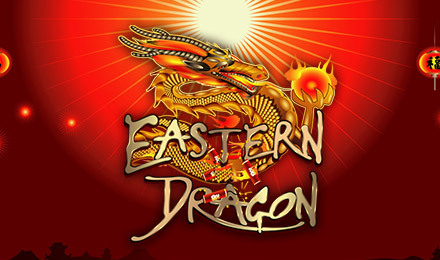 Get a taste of Asia in Eastern Dragon Slots. There are 5 reels, 20 paylines, authentic reel symbols and loads of chances to win! What are you waiting for? Spin to win today! Eastern Dragon Slots has an Asian theme, and the reels are filled with symbols like flowers, lanterns, Koi fish, golden coins and the Eastern Dragon itself. The Dragon is your Wild, and will double your wins when it appears in a winning line. If you spin the Dragon on the 1st and 5th reels, you'll get some incredible prizes, such as FREE spins! All your wins will be multiplied, and this bonus can be retriggered for even more chances to win! There's also a Scatter, which is the Golden Coin, which multiplies your wins by the amount wagered.